In places where government priorities and market imperatives create a world so capricious that to help a neighbor is to risk your ability to feed your family, and sometimes even your own liberty, the idea of the mutually supportive poor community is demolished. The poor blame one another for the choices of governments and markets, and we who are not poor are ready to blame the poor just as harshly. by others in the community to bring to the recyclers for money. His father, Karam Husain, is very ill from the air quality, but continues to sire children. And his mother, Zehru-nisa, does what she can to goad Abdul and his brother into prod-ucing more. Abdul’s younger brother, Mirchi, helps with the trash business and tries to stay in school. His eldest sister, Kehkashan, is married but left her husband so is a kind of disgrace. 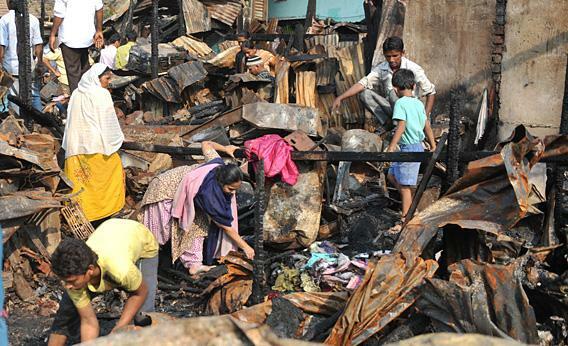 In the same house lives the very poor family of Fatima Shaihk and her older husband Abdul plus three small daughters. Fatima is an angry and envious disabled Muslim woman who works part-time and from home as a prostitute in spite of having a husband and many children in the home. Asha is a Hindu political-type power player (the puppet of an official) in the corrupt community of Annawadi but she is also a kindergarten teacher as well as an unofficial marriage broker . For a fee, Asha can steer the family through various legal hoops. Corruption can work in favor of those with a bit of money. She also works a bit as a prostitute to gain political advantage. She has a distraught husband and two upset daughters who are trying to get through college and work as public school teachers while their mother seeks marriage for them. For a more complete listing of characters see the “extras” in the Kindle edition. The neighborhood consists of tumble-down cardboard and cut cement shacks next to the very modern new airport which has its own security police force. Some older boys are lucky enough to work at a local luxury hotel. Others just get high on Eraz-ex – or commit suicide. The children in the neighborhood are neglected if not abused – they go to school, such as it is and scavenge for a few rupees. The Husain family has a bit more money than many in the neighborhood so they decide to remodel their “kitchen.” That’s when “bad luck” born of racism and envy enters the picture. How costly will this lawsuit be? How expensive is the hospital? Rupees? Lives? Hope? I knew in general that it was very bad but not specifically how it worked and how the poor worked the system. The style put the issues “in my face,” it gave the problems faces – this is something statistics just can’t do. Boo presented the options available to the younger girls, the boys, the older people. She showed the despair – what it’s really like to live like that – with the jail being available to anyone who wants to put his neighbor away, etc. The statistics became human beings. What struck me, I think, was that so many had hope of a better life if they could just find that valuable piece of trash which is worth more than the others – or if they could just get another year of school, such as it was, or that they could fix up the kitchen, or get a job at the hotel. These folks honed their skills whether it be finding trash or valuing and selling it, teaching, working the precincts politically – whatever – they were hustlers – going after that dream. No, of course not all of them did that – and often when they did there were forces (jealous neighbors, competitors in business, parents) working against their success – but so many kept trying. And although there corruption abounded, there were also those with some deep moral and ethical values. As a result of those aspects, I didn’t find the book totally depressing – it was almost hopeful to me – about the perseverance of the human spirit or something. Boo has written this book in an intensely creative or literary style, it truly reads like fiction – good fiction. 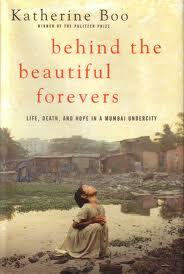 There’s a lot of dialogue, a lot of day-to-day life, in many ways a little reality TV show – “life in the slums of Mumbai.” The title, Behind the Beautiful Forevers refers to the sign on a wall near the slum, it says “Beautiful Forever Beautiful Forever Beautiful,” a corporate slogan for their floor tiles. 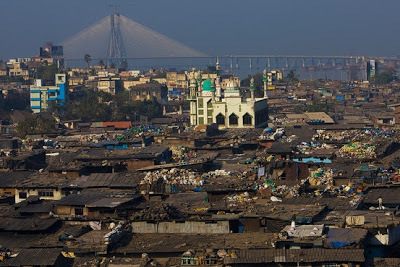 The slum of Annawadi is “behind” the wall sign. Boo uses quite a number of literary devices for both structure and style. There are several plot threads which meander through the book. One concerns the neighbor Fatima, her suicide and the resultant bits-and-pieces trial. The book starts out with Abdul running from the police who have finally decided to arrest him. This is followed by the build-up to that moment, acknowledges the moment about half-way through the book, and then follows the action off and on to its conclusion near the very end. – This break in the structure may be where Boo entered the picture – getting background on the material which took place earlier and then following the story from that point forward. Also, metaphors seem to be a bit more present than in your average non-fiction narrative – “He wanted a verdict of ice.” (p. 221) Finally, the reference to Faust (p. 229) is just a bit over the top. I was wondering how much was really accurate until I read the Author’s Note at the end. Yes, I believe Boo has written an accurate account of what happened to these families during the several years she was involved in the project. 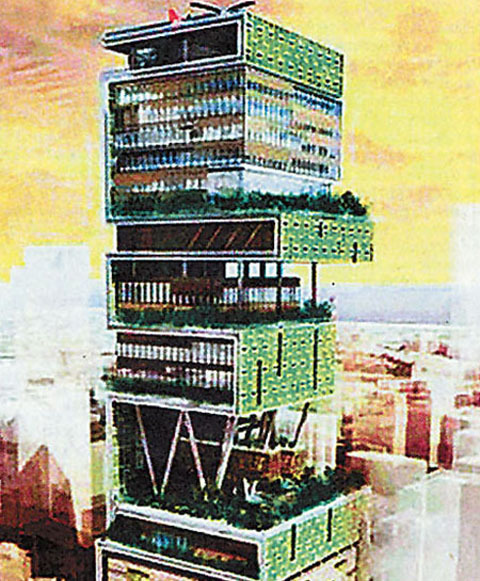 Mukesh Ambani, the richest man in India, mentioned on page 190. His father started out quite poor but he and his brothers inherited pretty well. Towards the end also is reference to the 2008 Muslim jihadis attack on Mumbai. Overall this is an horrendous indictment of India and it’s so-called reforms. Maybe the government tries, but always the schemers seem to know how to get around the rules and this is true from the highest ranks to the lowest. My calling it corruption doesn’t mean it doesn’t work – it’s the only opportunity for many.